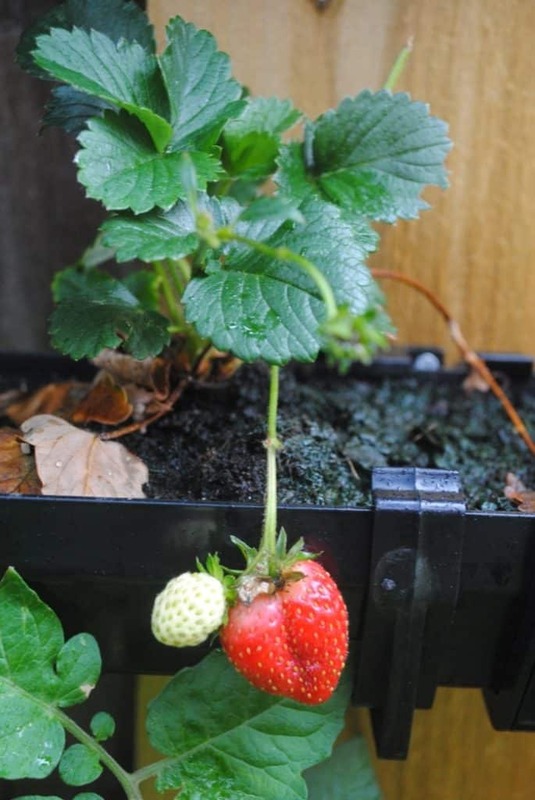 If you want to grow some strawberries this year, but you don’t have a lot of space in your garden, then give this DIY Strawberry Guttering a try – it’s cheap to make too. Nothing tastes more like summer than fresh, juicy strawberries, and with Wimbledon having just finished (well done Andy); this wonderful little fruit is always popular. With over 28,000 kilos of strawberries eaten during Wimbledon fortnight alone, it’s no wonder people are always after them. Like most people that live in the city, we don’t have a lot of garden space, so we choose to grow upwards. 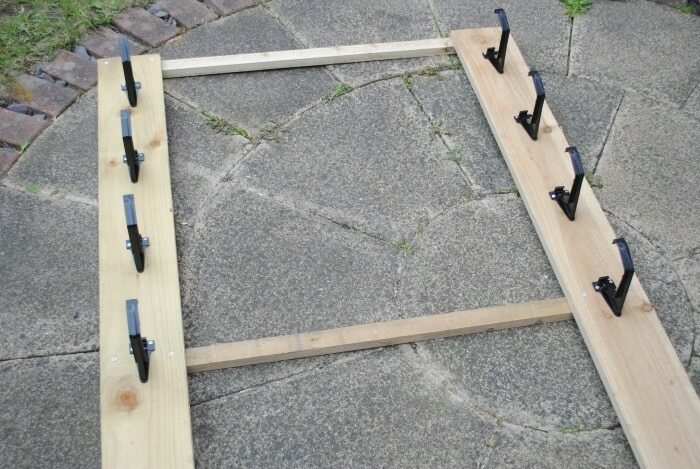 It’s Dave here with another DIY garden project. This was one of my favourites to make, because of how simple it was. Growing your own strawberries is easy – there are varieties that can be grown in sunny spots as well as shady areas. Make sure you research the type of strawberry you want to grow before planting, as a sun loving variety with not do well in a shady place. Strawberry plants that are grown successfully can harvest lots of fruit, but the plants can also take up quite a bit of space. If you are limited for growing space, what can you do when you can’t grow plants out? You grow upwards! 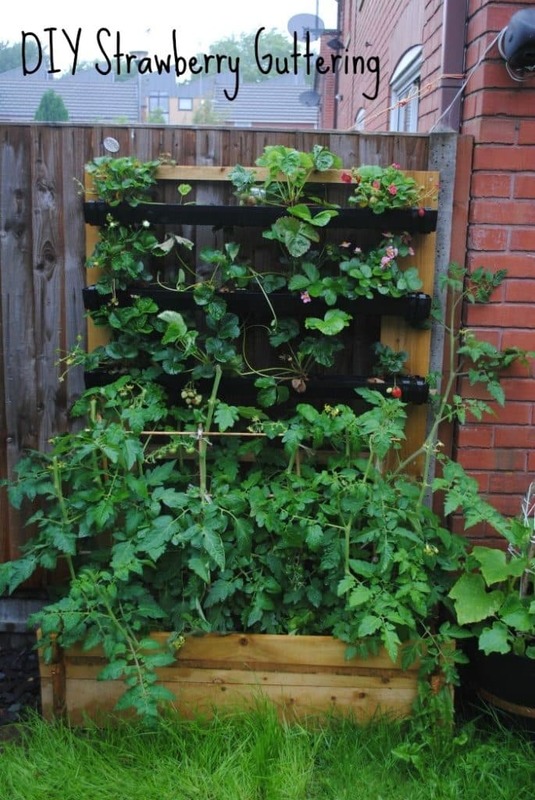 This is exactly what we did with the strawberry plants that were sent to us by Wyevale Garden Centres by planting them in a growing gutter system. 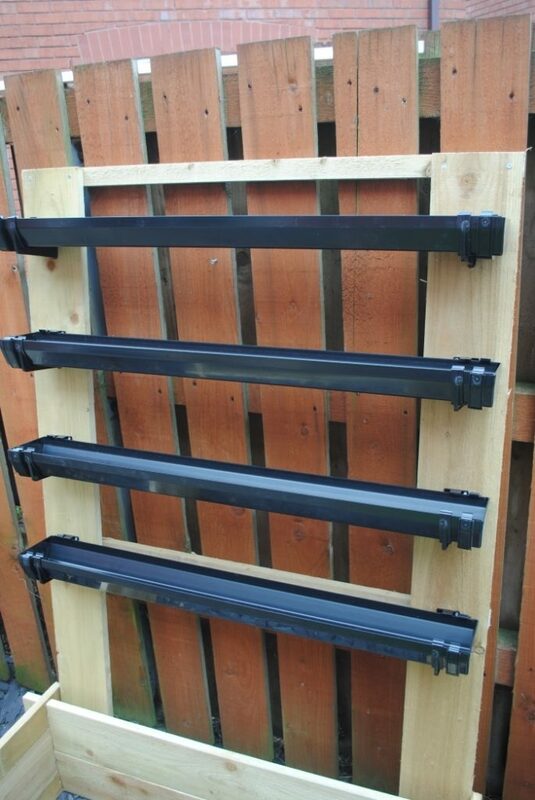 Growing gutters are easy to fix to vertical surfaces, or like we did, a custom made frame. We have tried growing strawberries a couple of times before, and they have never been successful and the plants died within a week. The Strawberry Plants from Wyevale Garden Centre arrived fresh and perky and they never wilted – instead they instantly flourished. I think it helped they we used really good quality compost that they send us too. It really is worth buying good quality products when you are gardening, as you will get a much better return – which is why we always use Wyevale Garden Centres. They deliver straight to you door too, so you don’t have to worry about getting it all home. 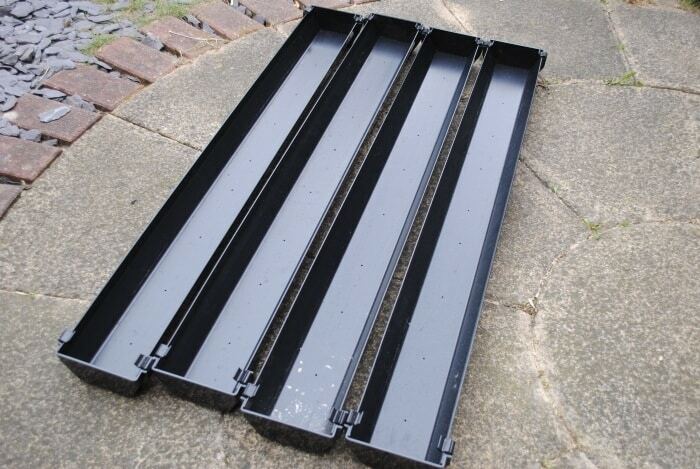 Plastic guttering can be bought from most builders’ merchants or large DIY stores for a fairly reasonable price, but remember that you will also need brackets and stop ends. 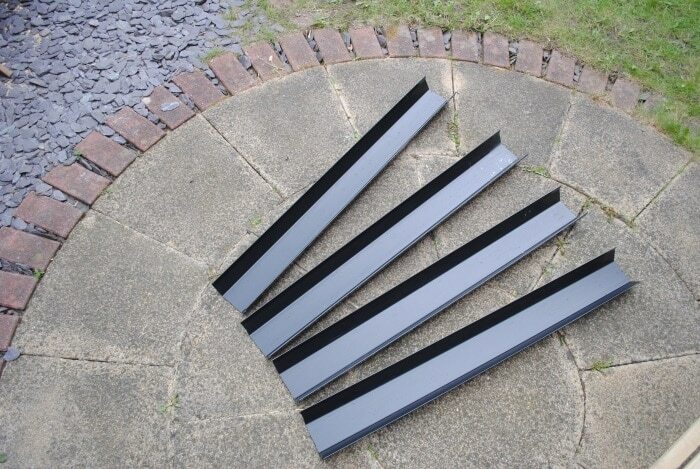 Once you have selected the type of gutter you want (there are many designs and colours to choose from) it’s time to get building. 1. 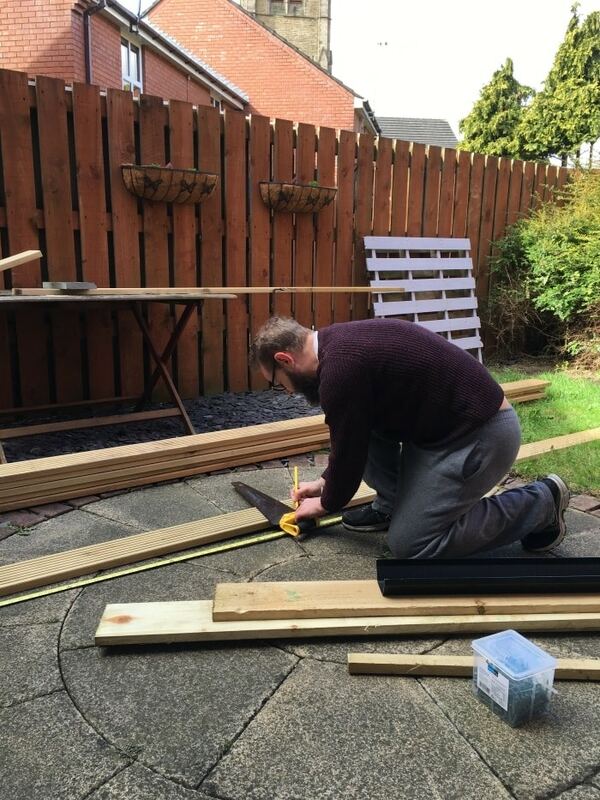 Measure your space and using a hacksaw cut the gutter to the lengths you require (mine are 1m long each). 2. Using a drill, make drainage holes in the base, spaced about 15cm apart. Put the stop ends on and the gutter is ready. 3. At this point, the brackets can be fixed to a vertical surface if you have a suitable one available and the gutter clipped into them. As we don’t have a vertical surface that can be fixed to directly, I constructed a simple frame from treated timber (it’s important the timber is treated as it will be resistant to the weather). This also makes the whole gutter system portable, should we need to relocate it. 4. For the frame, I used two lengths of 6×1” (140x22mm) timber for the uprights and two lengths of 2×1.5” (50x38mm) timber for the cross supports. I cut the uprights to 1500mm each and the cross supports at 1100mm each. For the uprights, measure where you want the brackets to be and screw them at equal distances apart. Do this for both uprights. 5. Position the cross supports at the back of the uprights and screw into place to make the frame. 6. This is now ready to be stood up and can be leaned against a wall, ready for your plants. For extra support, I fixed the frame at the bottom of the uprights to a raised bed that we already had. 7. The gutter can now be filled with compost (leave a small space below the rim for watering) and you can plant your strawberries. This type of growing gutter is also good for microgreens, pea shoots and herbs. After we planted our strawberries, we decided to remove the bottom gutter as we were also growing tomatoes in the raised bed below and they are quite tall. Actually, the tomatoes are now starting to take over a little bit, so you might want to consider that if you are growing something under the strawberries. I totally agree. You can’t beat home grown. I love Dave’s DIY post! I’m so unpractical that the step by step pics are a great help. Homegrown strawberries have the best flavour. I was lucky enough to go to the Wimbledon this year and fresh strawberries are always a good idea. 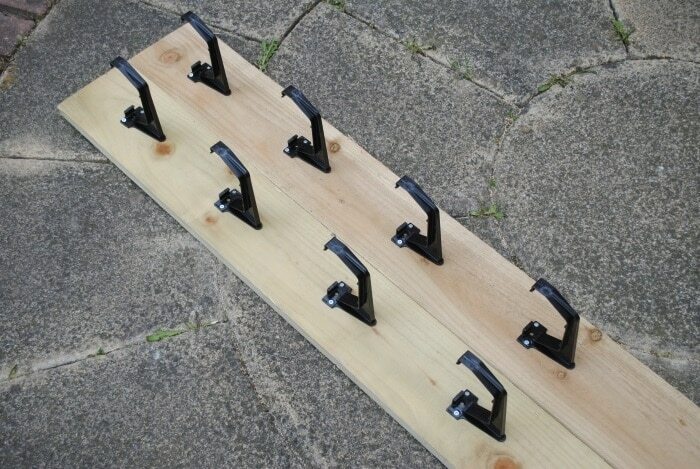 This is a great hack for guttering strawberries. Aww good for you guys! This is awesome, what a great job! Keep enjoying those berries! Sometimes just eating them is the best thing to do with them. How impressive – they look great! Wow! This is amazing! I wish I could have a strawberry garden at my place! So excited to see this grow more! Thank you. Strawberries can be grown in small pots, so even if you have no space, you can get growing! This looks interesting. I really would LOVE a herb garden…maybe this would work for it? Yes, this would work really well for herbs, but you may want to try using a deeper gutter. what an amazing idea! when i first saw your headline, my mind dig boggle slighty! This looks so fun and not to mention tasty! I love strawberries but they are getting so expensive, so maybe I should invest in growing them! Thanks for the inspo! Glad to have provided some inspiration. Strawberries can be expensive to buy, so growing them can save you a lot. Do you have any tips on how to keep the slugs away? We have tried growing things in the past and as soon as something comes through, the slugs eat it. Slugs can be a nightmare! A band of adhesive copper tape (available from garden centres or online) stuck completely around where you’re growing can stop them as they won’t crawl over copper. If you can’t do that, broken egg shells on the soil can help (too sharp for slugs to crawl over), or coffee granules sprinkled around the area as slugs don’t like caffeine (so don’t use decaf coffee). Good luck. This is such a fun idea and I think my kids would get a kick out of it too. It might be a nice little summer project for us to do. It is a fun and easy project that kids can definitely help with. 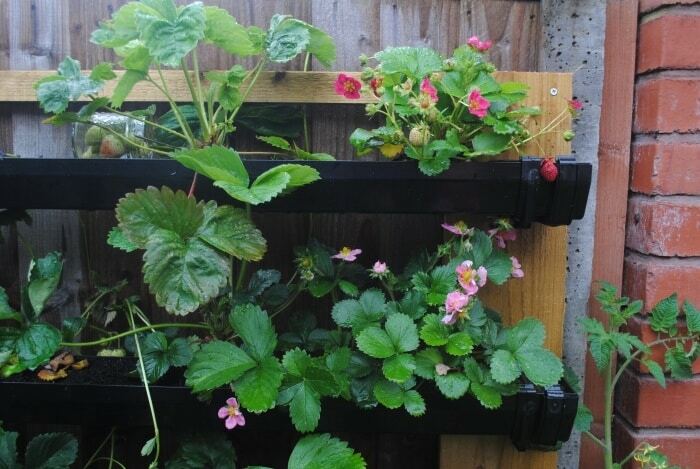 I’m impressed with your strawberry guttering, looking forward to seeing your lovely strawberry recipes in the future. What a great idea! I don’t grow strawberries, but this would be a great way to start. Going to show it to my DIYer tonight! There’s very little that’s better than a fresh strawberry.. Such a neat trick for space-saving!